Individuals with severe visual impairment may rely on a screen reader (software that reads content aloud) to access Web sites. Visual cues, such as images, section divisions or table headers, may be imperceivable to this audience unless additional information is added. Often required are text alternatives for images and other visual content, and the specification of key landmarks (e.g. headers, lists) within a document. Screen readers are pieces of software that read all the text within a digital document aloud. Most screen readers also allow users to move from landmark to landmark within a page. Landmarks can include section headers, links, table headers and other items indicating important divisions of information. The most commonly used screen reader is JAWS (Windows only), but other screen readers include NVDA (Windows), VoiceOver (Mac/iPhone), and Emacspeak (Linux). Screenreaders are often used by and associated with visually impaired users, but some, particularly Kurzweil (Win/Mac) are also used by individuals with certain reading disabilities. Braille Printers—Printers that print embossed (raised) Braille on a page. Refreshable Braille Displays—tool that raise pins to form Braille characters. Users place their fingers on the device to detect changes in characters. See a Braille display demo (with a smart phone). Embossed Printers—Printers that print embossed images and graphs with the edges raised. 3D Printers—Devices that convert images into three-dimensional objects. OCR (Optical Character Recognition) Software—Software that recognizes text embedded in an image and converts it to a text file. This is particularly useful for PDF documents in which each page is actually an image. Fangs Screen Reader Emulator for Firefox—Does not speak aloud, but can display any Web page in screen reader format (no text breaks, headers/tables announced). 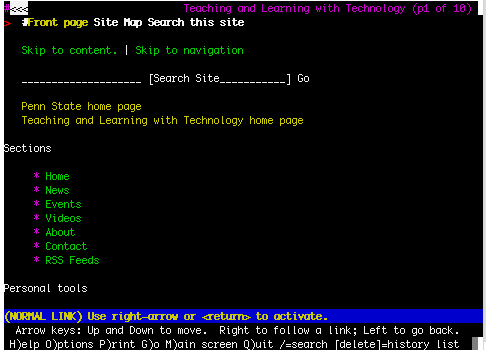 The following two images show a screen capture of the header at http://tlt.its.psu.edu in both Firefox and in Lynx. A text-only browser like Lynx shows an approximation of what a screen reader reads out. Like a screen reader, Lynx cannot display images, only image ALT text. It also has much fewer formatting options. Alt text to describe images or animations on the Web, in Microsoft Word and PowerPoint, Canvas, Flash, PDF files, and any other online document. Form Labels for Web forms and Flash forms that identify the functions of their fields. Semantic section headings indicated by something other than a format change. In Microsoft Word, authors should use the Heading styles. In HTML, headers should be indicated with H1, H2, H3, etc. tags. Complete keyboard functionality. Anything that can be done on a mouse should be doable on a keyboard. Frames labeled with meaningful titles. Language "tagging" to allow proper control of synthesized speech pronunciation. Software and online tools designed to read out menus and functions to screen reader user. Visually impaired users are not the only ones who use text-only browsers. Other segments of users, such as those on older PDAs or cell phones, or who have disabled image downloading because of a slow connection, may also benefit from the simpler interface. Text-only browsers are especially useful to users outside the United States, who may only have access to the Internet via a text-only browser or cell phone. who retain limited visual acuity. Identify yourself when speaking to a person who is blind and alert them when you leave. Feel free to warn individuals with visual disabilities of dangerous situations. If there is a person with a walking cane navigating around a car in the street or headed for a column, feel free to speak up and say, “Hold on you’re in the street,” or “Stop… there is a column there!” Construction areas are a particular area of concern. Do not grab arm or touch someone, this may startle him or her. Offer an arm or shoulder, when guiding someone. Never leave him or her in a free or open space. Leave them in contact with a wall or arm rail if you need to leave them for a moment. When offering a seat you may offer to guide their hand to the seat. Do not make assumptions of capability. Respect any persons’ ability to do things. People find ways and use tools to achieve their goals. Esref Armagn is a Turkish painter who just happened to be blind. He taught himself to write and oil paint with full visual perspectives in the paintings. Guide Dogs: Do NOT approach, try to pet, try to feed, or try to gain the attention of a guide dog. The dog is there to do a job and specially trained for that job. The casual attention offered to this dog may disturb the training and cause problems for the owner. A good rule of thumb to remember is if the dog is wearing his uniform or harness, then he is on duty. Note: If the dog is doing something inappropriate, inform the owner and allow the owner to correct the behavior of his or her guide dog. Speaking and giving directions; refer to directions by giving an approximate distance or number of streets and or give landmarks (They may recognize sounds of an escalator). Just remember to clarify the details of the direction, just like you would with anyone. Maintaining a conversation and using descriptive language with some who is blind seems like an odd tip. In a discussion between people there are visual cues many of us do not think about when starting and stopping a conversation. Imagine your cell phone going off and you answer the phone, while offering an apologetic look at a friend and mouthing silently sorry. This is NOT achievable with a person who is blind. Also, in conversation the reference to colors, patterns, design and shapes should not be avoided. Each person has various experiences and all forms of description are valuable. A person, who is blind, could be told the wall is a bright yellow and associate the color with the feeling of a warm summer day because the sun has been described as yellow. Just because the person may have never seen the bright color of the sun, doesn’t mean there is no association to the sun. With furniture placement, remember people who are blind or vision impaired memorize the layout of a room, especially if the room is frequently visited. Try to avoid situations in which the room layout changes. If you or someone else changes the room layout, you should warn those who are Blind/Visually impaired when he or she enters the room. Desks in a circle, or media carts brought in for presentations are just some examples that alter the space temporarily. Engaging in class activities should, also, be considered with a student who is blind. Moving desks for group activities, hands-on activities, or watching a skit or other students’ performances or presentations should be addressed and accommodated to allow a student who is blind to participate. Also, be aware, vision impairment may be degenerative in nature. This means the needs may change over time. As a teacher or employer, remember to clarify the needs with those who have vision impairments. And as a person with a visual impairment you should always maintain an “open dialogue” with your teachers or employers about changes in concessions.